The angelfish was popular from about 1955 to 1986. Listed in a late 1950's catalogue at $12, it was the most expensive item made by Blue Mountain Pottery at the time. In many areas of antiques and collectibles, it is sometimes curious why a particular item catches the attention of collectors. Possible reasons include: rarity, colour, size, style, price, age and designer. When it happens, acquisitive desire drives the price higher and faster than it would otherwise go. 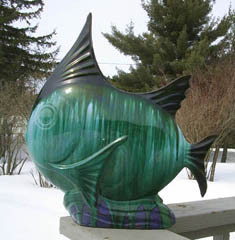 The angelfish made by Blue Mountain Pottery in Collingwood, Ontario, provides a fascinating case study. First produced in the mid 1950s, the angelfish was illustrated in the earliest known Blue Mountain Pottery catalogue as number 58. Its popularity continued into the mid 1980s when it was discontinued. A 30-year production run of any item in the burgeoning trend-conscious consumer market of the postwar period is quite remarkable. 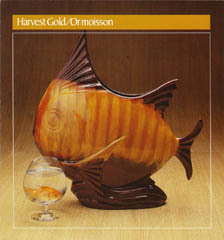 The cover of the 1981 Harvest Gold catalogue featured an angelfish to highlight the impressive glaze effects Blue Mountain Pottery could achieve. "It's a very imaginative design," says Dr. Richard Winterbottom, ichthyology curator at the Royal Ontario Museum. "It doesn’t really look like any specific kind fish, but has some similarity to the black crappie found in Georgian Bay. I think, however, it’s more an impressionistic interpretation of a South American freshwater angelfish that is common in the aquarium trade -- but with a big bite out of the top of it!" Although the angelfish was usually made with Blue Mountain Pottery’s traditional streaky green glaze, it did appear in the company’s harvest gold (brown and yellow) collection and was featured on the cover of the 1981 Harvest Gold catalogue . 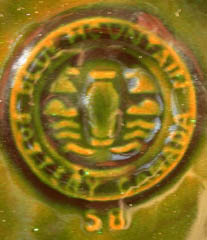 Examples in other popular glazes such as mocha, slate, jade, red or blue have not been seen by collectors or found in known Blue Mountain Pottery catalogues. But a few collectors do have a rare green example with a blue base. Since the angelfish itself is supported by a pedestal of waves, it seems only appropriate that the water be blue. "The angelfish looks more interesting when its base is blue," says collector Sharon Bennett of Parry Sound. "The all-green fish are very attractive too, but the blue reminds me of a sparkling lake in summer. This angelfish is one of my prized pieces of Blue Mountain Pottery." The angelfish was designed by Dennis (Zdenek) Tupy. Born in Breznice, Czechoslovakia in 1929, he completed the three-year program at the Strední prumyslova skola keramicka (Secondary School of Industrial Ceramics, founded 1884, www.keramichkaskola.cz in the town of Bechyne. Tupy graduated at the top of his class, specializing in design and mould making. Escaping military service in his homeland, Tupy came to Canada in 1951, eventually settling in Collingwood where he worked for fellow Czech Jozo (Josef) Weider (1909-1971), owner of the Blue Mountain Winter Park ski resort. With Weider’s assistance Tupy began Blue Mountain Pottery in 1953 at the age of 24. "Dennis, do something big!" Weider said one day according to Tupy who is now 76 years old and still living in Collingwood. "So I made the fish," explains Tupy. "It’s what came into my head. My ghost told me to do it." Tupy often uses the word "ghost" to explain the source of his design inspiration. It seems a fitting term, similar to "voice" or "muse." It's the unpretentious way he puts his superlative talent into words. It is how he explains the way his mind and hands work together. Exactly where the idea for a huge flat fish came from is anybody's guess. It was, after all, a half century ago, and Tupy doesn't remember everything his muse told him that day. No matter, the angelfish design sprung from his genius. And equally important, it was exceptionally stylish for the time. Since these pieces had unglazed footrims, stilts were unnecessary. The angelfish was a popular item when it first appeared around 1955. Although early examples, including the ones with blue bases, have flat glazed bases that bear no maker's mark, they were identified with factory stickers and hangtags. 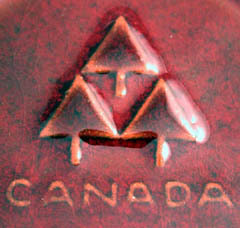 From 1967 to 1972 angelfish were moulded with the Three Trees mark, from 1972 to 1976 the BMP Canada mark, and from 1976 to 1986 the Vase and Waves mark. Surprisingly, the long term popularity of the angelfish did not inspire other potteries to copy it. Throughout the 19th and 20th centuries, if one pottery produced a commercially successful item, others would often copy it to reap windfall profits. But the myriad of production challenges facing Blue Mountain Pottery in their efforts to make the angelfish would have been immediately obvious to pirating potters. For them, the difficulties were too great. And they could never successfully replicate that streaky green glaze. This clearly demonstrates the high level of ingenuity and technical expertise at Blue Mountain Pottery. One known exception, however, was Danesi Arts (1937-1975), a Toronto plaster and pottery giftware manufacturer. Their ceramic items (produced from 1955) were cast from original designs created by founder Primo Danesi or commercial moulds. A Danesi copy of the Blue Mountain Pottery angelfish appeared on eBay in June and sold for $45. Its slightly smaller size indicated that it was moulded from a Blue Mountain Pottery original. An early angelfish is often immediately recognizable by the slight iridescent look of its glaze. This is a natural ageing effect that happens to the surface of certain types of glass, as well as glass-based formulas such as ceramic glazes. Although designed as a vase, few examples of the angelfish are found today with water marks or scaly residue. It seems that most buyers appreciated its bold sculptural design. William Rolling was employed at Blue Mountain Pottery from 1964 to 1979 as the factory superintendent. Born in Collingwood and now retired, Rolling worked in the town’s Kaufman Furniture factory before coming to Blue Mountain Pottery. In addition to his managerial duties, he also prepared the clay, and cast, glazed and fired angelfish. "I worked in a barn on Jozo’s farm that had been converted into a self-contained pottery," explains Rolling. "This location was in addition to the two main factories, the one on Pine St. and the other on Mountain Rd. We didn’t call them angelfish then. Each model had a number. I still remember them all today. The angelfish was always referred to as number 58." Following the first meeting of the Blue Mountain Pottery collectors in Collingwood in July 2003, and subsequent club formation a year later, the focus on collecting has sharpened. The closure of the Blue Mountain Pottery factory in December 2004 has further spurred collector interest. These events have brought many vintage pieces of Blue Mountain Pottery into the market (antique malls and eBay), and prices for the more unusual colours and shapes have been increasing rapidly. The popularity of the angelfish received an unexpected boost when it appeared on the cover of the Winter 2005 issue of the Toronto-based Antique and Collectibles Trader magazine. It promoted the magazine’s feature article, Blue Mountain Pottery: Canadian Icon. During January and February, 15,000 copies were widely distributed throughout Ontario. About a dozen magazines have been offered on eBay, either individually or as a bonus with the purchase of a piece of Blue Mountain Pottery. 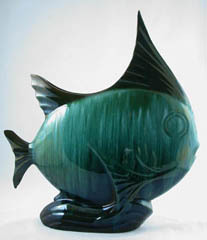 Although the angelfish was used as the lead photograph in the magazine article to illustrate Blue Mountain Pottery's renowned streaky green glaze, it was not intended by the author to be the cover shot. The preference was for a grouping of pieces to illustrate the colourful range of the company's glazes. But the magazine editor chose the angelfish, making it instantly symbolic of all Blue Mountain Pottery production. Once the "must have" desire was ignited among collectors, angelfish prices began to climb. In 2001, they sold for about $10. Last summer, angelfish could be bought for under $50. But by April the price had risen sharply to $250. Since then, prices have softened, but remain in the $150 to $225 range. In May, an angelfish in Harvest Gold, a much rarer glaze colour than green -- sold for $385. But it is not only Blue Mountain Pottery collectors that go after the angelfish. Since its look is so 1950s, many buyers eagerly seek out this piece to complement their retro style décor. Oddly enough, an angelfish appeared on eBay in late January with its tail completely broken off and missing. The long-time U.S. seller included 10 large photographs showing every angle of the fish, including the area were the tail had been. Still, the opening bid was $24.99US. Needless to say, there were no bidders. It was re-listed at $9.99US and ignored yet again. In June, an angelfish was listed on eBay with two minor chips on its fins. The opening price of $9.99US did not entice a single bid. Unless a piece is so rare that minor condition problems can be forgiven, collectors only want perfect examples, regardless of price. Sometimes good repairs can be difficult to detect. When buying an angelfish, check the fin tips. It is easy to disguise repairs in these areas once they have been sprayed. Also, check the sides of angelfish to see that they have not been accidentally pushed in or dented during the production process. Make sure that all the fin tips come to relatively sharp points. Sometimes the tips were broken off in the factory, but to save the piece it was still glazed but sold as a second. A noticeable glaze drip on the bottom tail fin would also make an angelfish a second. Collectors sometimes enjoy a particular piece so much that they keep buying more examples of it. Bryce Eaton in Brainerd, Minnesota, has 26 angelfish. "The style and shape really appeal to me," says Eaton. "I bought the first one at auction 14 years ago. I don’t really need any more, but I find it hard to resist bidding on them. They're displayed as a "school” on my dining room buffet." With a collection that large, it is easy to notice slight differences. Some angelfish are an inch taller or longer than others. Sometimes the vase opening is slightly wider or longer. These variations were the result of the shrinkage characteristics of the various clays that were used during the long production period of this piece. Also, as the moulds wore out, new ones had to be created. Minor size and design variations would invariably occur during this handmade process. A recent sampling of eight angelfish gave the following results: lengths ranged from 15-1/4 to 16-1/4 inches, base widths from 3-1/2 to 3-3/4 inches, and heights from 16-1/2 to 17-1/2 inches. When the angelfish were lined up by date of manufacture, no correlation was found between size and age. From a survey of existing catalogues, the 1974, 1976 and 1977 editions list the height as 17-1/2 inches, while the 1969 catalogue says that it is only 16 inches. A survey of existing Blue Mountain Pottery catalogues shows that the price of the angelfish steadily increased to $39.95 in 1986, its last year of production. Compared to other pieces, it never ranked lower than the seventh most expensive item (topped in different years by a tea service, three-tier buffet tray, bottle vase, four large animals, two types of hanging planters, and two versions of a lazy susan). When Robert Blair bought Blue Mountain Pottery at the end of 1986 (becoming its last president and owner), the angelfish was replaced with a realistically sculpted version, called Tropical Fish, number 132 (see photo). It was almost as large: 12 inches long, 4-1/2 inches wide, and 16 inches tall. It was made in green from 1987 to 2000, in blue from 1998 to 2004, and in white (with a white clay body) in 2000. The Tropical Fish remained in production until the factory closed in 2004. It was always among the highest priced items and ranged from $29.95 to $39.95 (exceeded only by a large elephant made from 1980 until the factory closed, the Romar Collection from its introduction in 1997, and the Robert Wilson Collection from its launch in 2002). Coincidentally, this fish was also designed by Dennis Tupy. He left Blue Mountain Pottery in 1960 to open his own pottery, Canadian Ceramic Craft, in the earlier Blue Mountain Pottery factory in the village of Craigleith, 11 kilometres west of Collingwood. (Tupy later built a new factory and showroom in Collingwood, renaming his company Rainbow Ceramics.) 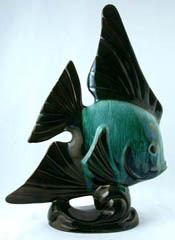 At Canadian Ceramic Craft, Tupy's second angelfish was in production by the early 1970s (Tupy also made a very complex piece, number 100, combining two angelfish positioned at different heights and angles.). When he retired in 1984, Robert Blair took over the factory for two years until his purchase of Blue Mountain Pottery. (Blair had been a manager at the Blue Mountain factory from 1971 until his retirement in 1982.) At Rainbow Ceramics, Blair used the existing moulds which included Tupy’s fish (originally called number 88 and renumbered by Blair as 132). When he became the new owner of Blue Mountain Pottery, Blair continued the production of the fish, a far more stylish version for the 1980s than the earlier angelfish. The appeal of the first angelfish, both then and now, is its design. Having a relatively flat profile, it can easily sit on a window sill, mantel or shelf. Its distinctive outline is instantly recognizable and its broad flat sides gave the Blue Mountain Pottery company a superb opportunity to demonstrate its unique glazing abilities. Many collectors agree that the design of the angelfish is stylish, dramatic and timeless. Beyond that, it is just plain fun. All this is a reflection of the magic of Tupy, an exceptionally talented artist who, working with his muse, created a ceramic masterpiece for Canada. For membership and convention information contact president Bruce Dyer at oakpoint2002@yahoo.ca or call 705-878-0444. Visit the Club’s website at www.oldfriends.ca. To join, send your name, address, phone number, email and dues to Diana Buckley, 597214 2nd Line Mulmur, RR 3, Shelburne ON L0N 1S7. The membership fee is $20 Canadian (make Canadian cheques payable to the Blue Mountain Pottery Collectors Club), or $16 US (payable to Diana Buckley). You can also make a PayPal payment of $16 US to dbuckley@bmts.com (please put “BMP Collectors Club” in the message title). Both authors are avid researchers and collectors of Blue Mountain Pottery and members of the Blue Mountain Pottery Collectors Club. Conrad Biernacki is the programs manager at the Royal Ontario Museum and writes the weekly Objects of Desire column for the Toronto Star (email conradbiernacki@sympatico.ca or call 416-586-5636). Todd Milks is the president of EstateNet.ca, a Toronto-based estate evaluation and antiques business (email todd@estatenet.ca or call 416-929-2011).